These new pictures are the 5 puppies we have for sale, that are 7 weeks old now. They will be ready to go at the beginning of February at 8 weeks. 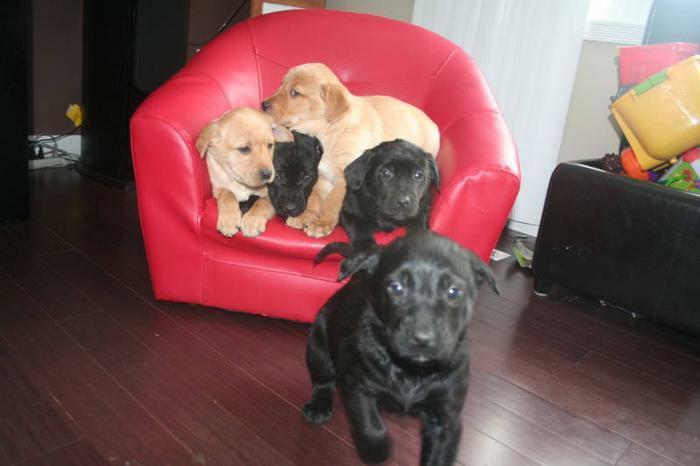 There is 1 black male, 1 black female (she is the one who won't stay still in the pictures. My personal favorite, so much personality, a beautiful dog), and 2 blonde females (one has short hair, and one long hair). All puppies are heavy set, thick, and blocky. They will be big, beautiful dogs. They have had their first shots. Raised with our growing family, these puppies will be well socialized, friendly, and ready to adapt to your home or farm. They are all very healthy, beautiful puppies! These dogs are best suited to a farm, acreage, or BIG back yard. The puppies were born December 8th. The father is 1/2 German Shepherd 1/2 Lab, and the mother is 1/2 Lab 1/2 Retriever. Both parents are wonderful dogs with great temperaments. They are onsite and can be viewed. Call or text 381-, or reply to this ad to set up a meeting. We will take deposits to hold puppies until they are ready to go at 8 weeks.